Due to its exceptional location, every event at Neuville becomes truly magical. This family estate, 50 km west of Paris and set in the middle of a 250-acre private park, enables you to entertain as you would at home but in a grand and authentic decor. 1. 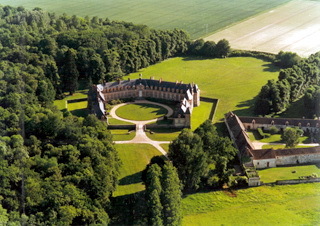 The 16th century chateau istself, built in brick and stone, is a listed historic monument. All the main rooms on the ground floor will be at your disposal to welcome and entertain up to 350 guests. 2. Le Relais is a farmhouse of the time of Louis XIV. The beautiful Pressoir together with sitting rooms on the first floor will accomodate up to 100 guests. 3. Le Relais, as above, but with the addition of the 150 m2 Silo room so that 200 guests can be accomodated.